A great way to reuse old materials while reducing waste is to repurpose old or unused items into wonderful new pieces. These repurposed decor ideas are some of my favorites from around the web. Creating new furniture from old stuff is a great way to repurpose items that are headed for the landfill. This unique cat bed was once an end table. Just turn it upside down, add a little trim and a pillow for a fast project. Here, new legs were mounted to the table top. 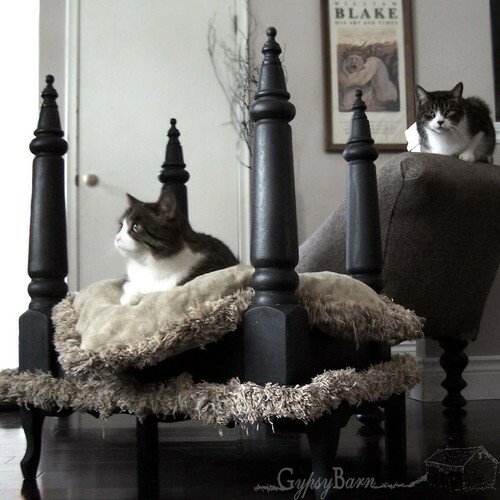 The old legs have become the canopy posts that give this bed the royalty treatment that all cats deserve. (For more great pet ideas, check out these articles – here and here). I absolutely love it when furniture is used for bathroom sinks and vanities. This old dresser is one of my favorites. However, if you want to do something like this, there are a few things to consider. You would either want to change out the top for a waterproof material – such as granite. If you want to keep the wood top, make sure to use a good quality spar urethane or marine grade sealer. I personally love the wood top, and that is very doable as long as you use the correct products. If shabby chic is your thing, this should be right up your alley. 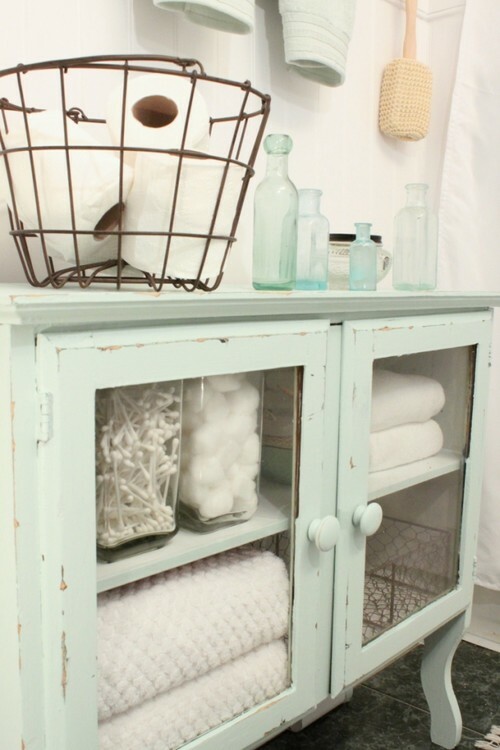 This linen cabinet was once half of a kitchen hutch. It has been painted in a minty green tone and then distressed. This was actually a paint from the Debbie Travis collection at Canadian Tire, but an Annie Sloane paint would give a similar result and would probably be easier to achieve. 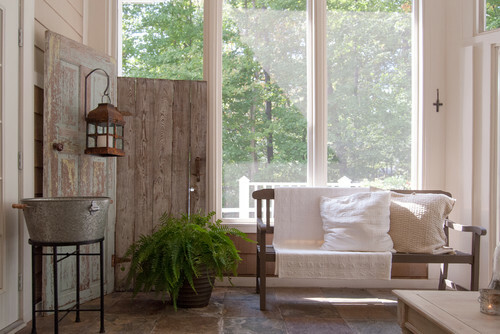 Repurposed windows and doors are quite a popular upcycle trend right now. With that in mind, I wanted to include a selection of some great repurposed decor ideas for this category. 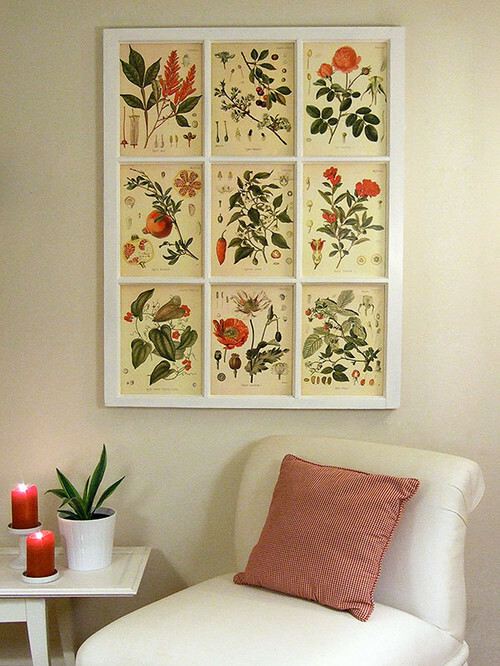 The look -above – can be achieved by inserting a collection of your favorite prints into the lites. Wallpaper is also a great option, as is family photos. Why not use an old french door for you shower. To do this, you would need to use a spar urethane or marine grade sealer to protect the finish from the constant moisture. ( same as an exterior door) In addition, this door has a shower curtain placed on the inside to further protect the door. 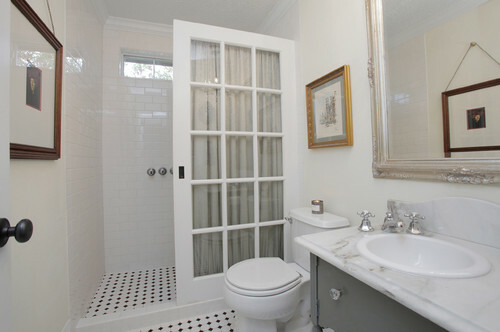 Plus, the shower curtain provides privacy and allows the window panes to stand out. 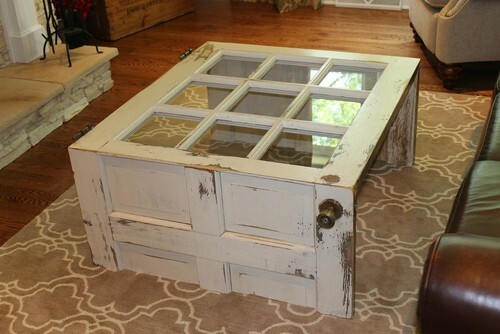 Here, a door has been turned into a coffee table. The bottom half of the door was removed and divided into two section. Then, the two sections were used as legs for the glass paneled top. Notice how the door knob and hinges have been left in place. This is one of the best door repurposing jobs that I have seen. Crown molding has been added to both the top and the bottom of the door. Then, it has been refinished in a nice warm tone. 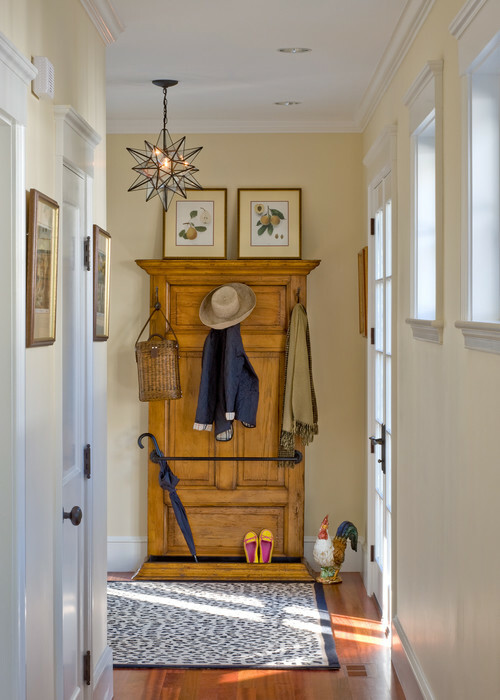 Hooks allow for a place to hang coats. While a towel rod has been added to serve as a keeper for umbrellas. The bottom has been finished out to hold shoes. 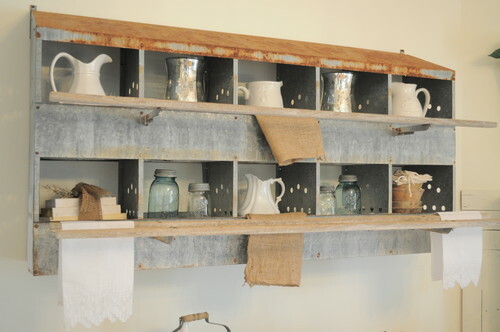 An old chicken nesting box has been turned into a storage/display case for this farmhouse. Notice how the perch is being used as a towel rack. Sometimes an industrial or commercial piece makes a unique feature in a home. 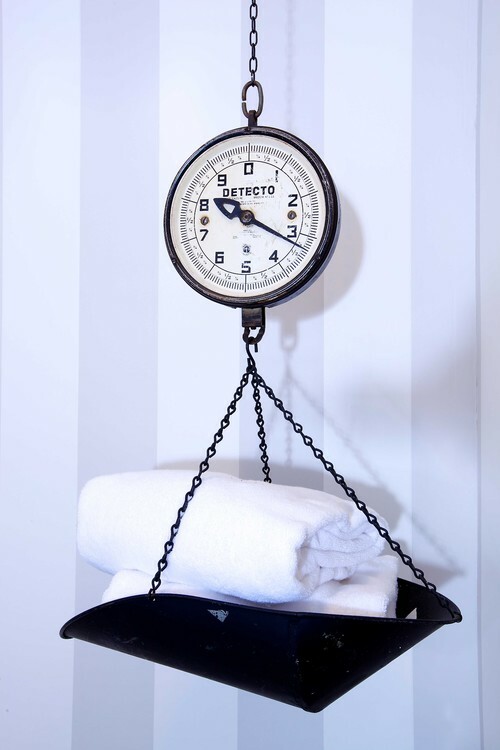 I would love to have a scale like this for a guest bathroom. (more great towel spaces can be found here). 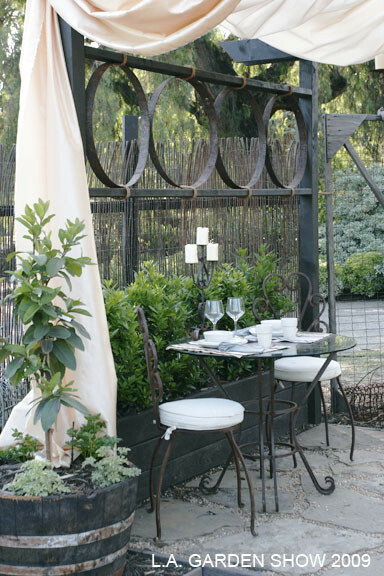 Can you guess how this planter box/patio wall was created. Obviously, we have a wood frame. However, the rings at the top are actually rings from old wine barrels. Quite a nice and creative way to use old materials, don’t you think? 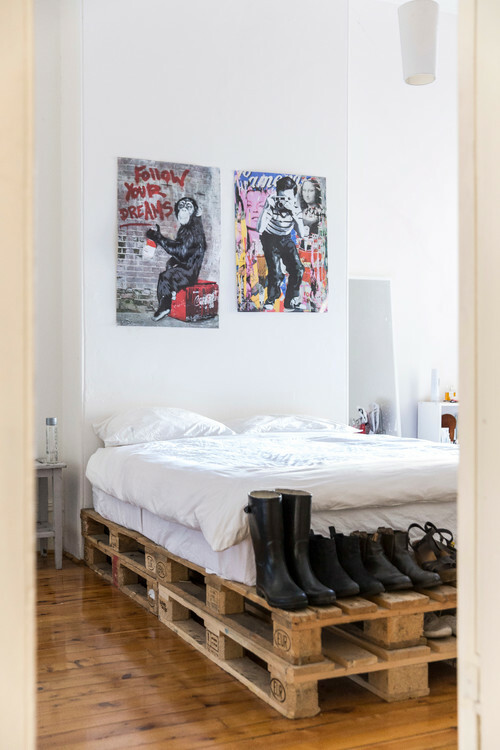 Pallets, pallets, pallets….. everyone is using old pallets for everything. This bed is no different. Just make sure that the pallets are structurally sound and well supported before attempting to use it in this fashion. 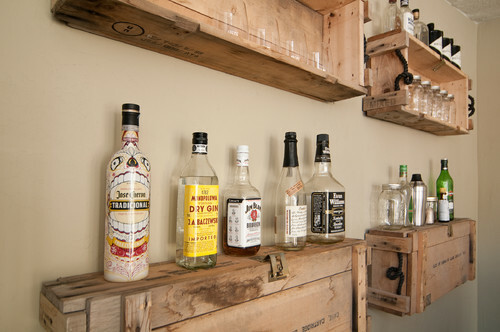 Another old pallet repurposing job are these bar storage/display shelves. This project would take a bit more altering than the bed above, but just as nice. 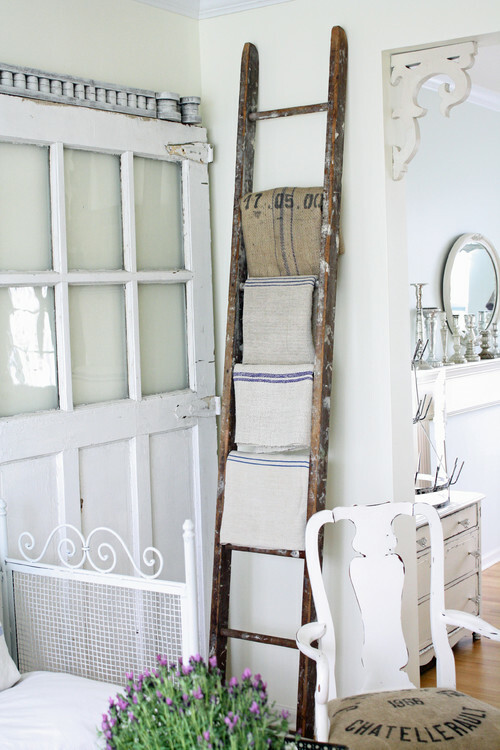 Another very popular upcycle is a ladder towel rack. 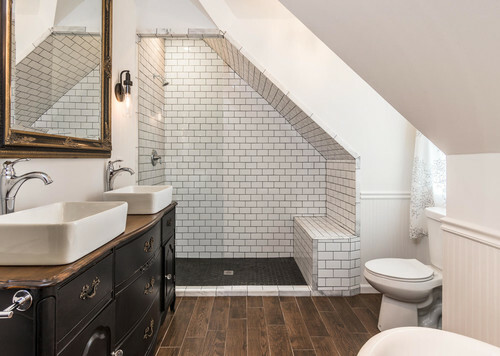 You can probably buy a ladder towel rack that is designed to “look” old, but why not just use a real ladder. The old wooden ones are best and can sometimes be found at flea markets or yard sales. 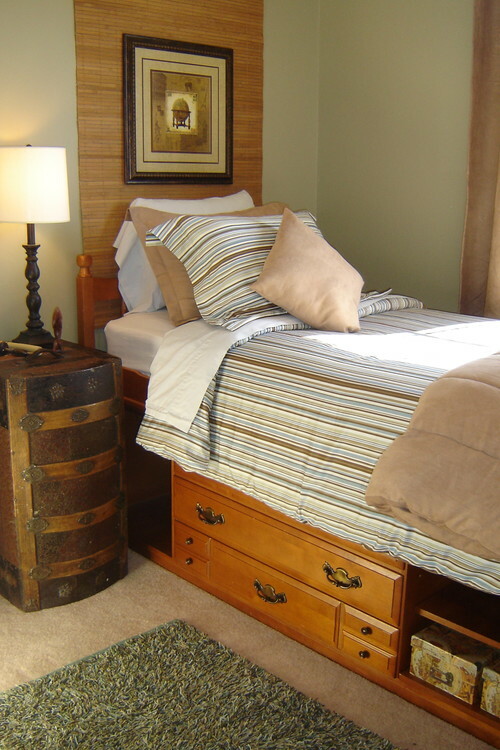 Here, an old trunk has been flipped on its side to create a nice nightstand for this room. There is not really much more to it than that. Super easy! 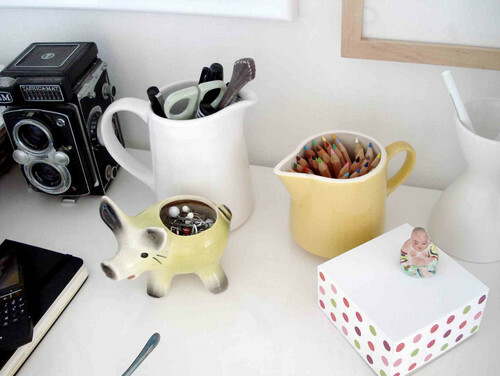 And last, but certainly not least, convert containers, boxes, or jars into desk or craft storage. There is no need to buy pencil holders, you probably have something around your house that would serve the purpose nicely. Plus, I love the character that can be added to a space by this method.